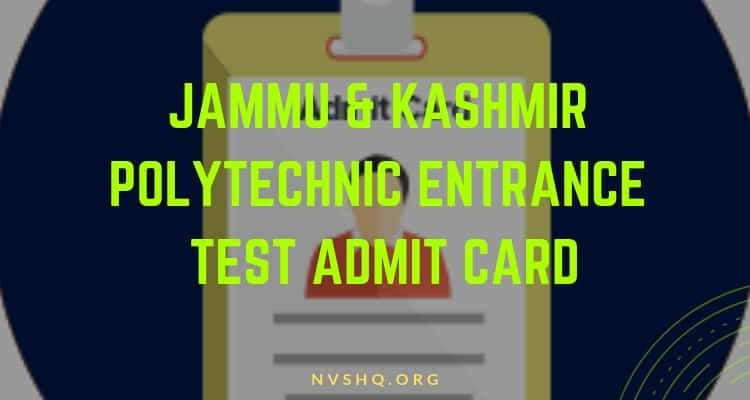 JK Polytechnic PET Admit Card 2019: J&K polytechnic PET procedure for filling application has been completely successful and large no. of applicants have applied for polytechnic entrance exam. As the PET exam is scheduled for 7th April 2019, conducting authority is expected to issue the JK polytechnic PET admit card on 22nd March 2019. Once the polytechnic admit card will be made available on the official website, candidates will be able to download and print it. J&K Polytechnic Entrance Test (PET) is an entrance exam conducted every by the Board of Professional Entrance Examinations (BOPEE), J&K for the admission of the eligible students to various polytechnic courses in different institutes and colleges of the state. 2 How to download JK PET Admit card? For more details, keep going through the article. Here you will get all the important information related to the admit card of JK PET 2019 exam. J&K PET 2019 admit card will be uploaded online of the official website. Admit card will be issued only to the registered candidates on the prescribed date. Registered candidates are those applicants who have successful filled the online application form and has made the payment of the prescribed application fee. Applicants have to download and print it online by using the login credentials. As per PET 2019 information brochure, admit card will tentatively release on 22nd March. All the details regarding to the issue of admit card will be updated on the official website and also here in this page. Admit is an important document from the exam point of view. All the PET candidates are required to bring it to the allotted exam centers on the day of exam. Candidates found without the valid hall ticket will be debarred and restricted from writing the exam. They must ensure that they have the admit cards with them before leaving for the exam center. How to download JK PET Admit card? Visit official website of BOPEE for J&K PET 2019. Click on the PET 2019 admit card link mentioned on the homepage of the website under the head Admit Card. Enter the application no., password and other required login credentials (if any). Admit card will be displayed on screens after submitting the login details. Download the admit card and take multiple printout of admit card. Admit card is an important document that hold crucial information about the exam and examinee. Therefore, it is the responsibility of the candidate to keep their admit cards safely. The information mentioned on admit cards will be based on the information furnished by the candidates in the application form. As we have mentioned above that is compulsory for all the candidates to bring their hall ticket to the exam center. Along with their hall tickets, candidates also have to carry some important supporting documents with them. This document is basically the ID proof of candidates. PET 2019 admit card will be released in the month of March. Admit cards will be published online. Mere possession of admit card do not ensure the ineligibility of candidates. Candidates will be notified through the official website and therefore all the candidates are advised to stay updated with the information of online portal. BOPEE Office, Bhagat-i-Barzullah, opposite J&K Bank, Srinagar-190005 (visit only in working hours). No candidate will be given entry to the Test center/ examination hall without a valid admit card and supporting documents. They must make sure that their admit card is not defaced, mutilated or changed in any manner. Candidates are advised to keep their admission card safe till the completion of the admission process. If you have any question then you can ask us in the discussion forum below.